Taking a Windstar cruse has always been a “bucket list” adventure for me. My husband has never been to Italy and I always wanted a reason to return, so the itinerary sold us and we could cross many travels off our list. So this is a first-time Wind Star cruiser review. I loved the idea of sailing on a smaller ship. I’m 49 and my husband is 59, so we weren’t looking for a large ship, nor all the hoopla of the large ship offerings. We knew going in the entertainment at night was limited, and the general age population was going to be a bit older and were okay with this. Upon getting to the port, the embarkation process was quick. We signed waivers for the water sports deck, a health questionnaire and shook hands with the captain and onboard we went! They collected our passports (they hold onto them for the duration of the cruise and provided us with our key cards. We were able to sign up for dining options (a couple of restaurants require reservations) at that time and then headed off to our room to drop off our hand luggage. The veranda was already opened for lunch, which was welcoming and had a good variety. The ship: The Windsurf holds 300 passengers and almost 200 crew. Good ratios for personalized service. The ship is beautiful, but you can see it’s going to need to be dry docked soon. Little things like seeing deep scratches in the wood floor, frayed carpet in areas, and rust and barnacles on the keel indicated this ship needs a bit of TLC. That being said, all these issues also leant itself to the charm of there’s no overdone grand staircase, neon lighting, grandiose or brass railings that you would see with the uber-larger ships, and we were perfectly okay with that. The deck chairs are in good condition, the bars are orderly (although I noticed the mirrors are in desperate need of cleaning) and the dining rooms are gorgeous. One of the best parts is the open door policy the bridge has for passengers to come in and see the controls and talk with the crew. They’ll close the bridge when going into port or leaving, for safety, but we went in at midnight one night and talked with the crew. They were just as inviting then as in the middle of the day. The room: We got a deck 1 room (room 129) mid ship. It was comfortable and tastefully decorated. There’s plenty of storage space, taking advantage of every nook and cranny. The bathroom is larger than most cruise ship bathrooms for a standard sized cabin. There was a double closet with plenty of hangers, a safe, a mini bar and fridge stocked with sodas and beer and a tray of fresh fruit. There were bathrobes and slippers for us, as well as L’Occitane bath products and soaps. Our room attendant was sweet and turndown and make up service was always quick. One day, I had to leave a note for additional soap and shower caps, which in my opinion should be automatic, but otherwise, she was pretty attentive. The dining experience: We didn’t eat in the French restaurant, the Stella Rose, so it wouldn’t be fair to comment, except to say the dining room is classily decorated. The AmphorA is the main dining room. The food was always outstanding and well proportioned. It’s open seating, so you have the ability to show up and either dine by yourself or join others at a larger table. My husband and I are pretty social, so we opted to join others on most nights and found ourselves meeting new people and making some great friends. They serve specialized courses each night, but also have some standards every night, in the event you didn’t like any of the specials. If you want a specific wait staff, you can ask the matre’d and they’ll seat you in that server’s section. If you have allergies, all you have to do is let them know and they’ll provide you with a menu for the following night’s meal and you choose your options. They’ll prepare that meal selection with respect to your allergies. The Veranda is the restaurant for breakfast and lunch. We only had a couple of lunches on the boat, so I won’t give a large review on this, but the breakfasts were amazing! There’s a full buffet, a omelet bar and an a la carte order menu where you can get eat waffles, pancakes, eggs Benedict and more. At night, the Veranda is converted to the reservation-based restaurant for dinner. Candles is Serves lots of specialized choices. We had filet mignonette or chicken and seafood skewers. Everything was delicious and prepared to perfection! Entertainment: By day, The Windsurf has a platform water deck and on certain days, the staff will open it up, for water sports like kayaking, water skiing and just swimming in the open water. By night, the entertainment is limited, but you make it your own. There is a small casino with tables and slots. The main lounge had a 4-person band, but their song choice was “sappy” so we headed over to a deck bar, the Compass Rose, where a duo, “Marci Gras” rocked the place until they closed every night. There’s a crew talent show one night, which is silly fun. We didn’t do any shore excursions. We researched the ports and did our own thing. Some ports we just walked around and explored, in other ports, I hired private guides (for much less than the private tours offered by WindStar) so we could get a customized taste of the ports. Many people we met did take the shore excursions and the reviews were mixed based on the expectations versus the reality, but overall, they seemed to have a good time. If you would like to know about our excursions, feel free to contact me directly. We had such a great time that we were saddened to disembark in Venice. There was nothing we would change about this cruise, and I haven’t been able to say that on most cruises. My husband and I agree that after this experience, we don’t ever see ourselves on a large cruise ship again. The experience of getting to know most of the passengers, the crew and the intimacy of it all really appealed to us. We would definitely consider another Windstar cruise and now that we’ve done the largest of the fleet, I’d be interested in trying the yacht/liner fleet as well....of course, it’s all dependent upon the itinerary. Taking a Windstar cruse has always been a “bucket list” adventure for me. My husband has never been to Italy and I always wanted a reason to return, so the itinerary sold us and we could cross many travels off our list. So this is a first-time Wind Star cruiser review. I loved the idea of sailing on a smaller ship. I’m 49 and my husband is 59, so we weren’t looking for a large ship, nor all the hoopla of the large ship offerings. We knew going in the entertainment at night was limited, and the general age population was going to be a bit older and were okay with this. Upon getting to the port, the embarkation process was quick. We signed waivers for the water sports deck, a health questionnaire and shook hands with the captain and onboard we went! They collected our passports (they hold onto them for the duration of the cruise and provided us with our key cards. We were able to sign up for dining options (a couple of restaurants require reservations) at that time and then headed off to our room to drop off our hand luggage. The veranda was already opened for lunch, which was welcoming and had a good variety. 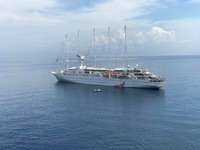 The ship: The Windsurf holds 300 passengers and almost 200 crew. Good ratios for personalized service. The ship is beautiful, but you can see it’s going to need to be dry docked soon. Little things like seeing deep scratches in the wood floor, frayed carpet in areas, and rust and barnacles on the keel indicated this ship needs a bit of TLC. That being said, all these issues also leant itself to the charm of there’s no overdone grand staircase, neon lighting, grandiose or brass railings that you would see with the uber-larger ships, and we were perfectly okay with that. The deck chairs are in good condition, the bars are orderly (although I noticed the mirrors are in desperate need of cleaning) and the dining rooms are gorgeous. One of the best parts is the open door policy the bridge has for passengers to come in and see the controls and talk with the crew. They’ll close the bridge when going into port or leaving, for safety, but we went in at midnight one night and talked with the crew. They were just as inviting then as in the middle of the day. The room: We got a deck 1 room (room 129) mid ship. It was comfortable and tastefully decorated. There’s plenty of storage space, taking advantage of every nook and cranny. The bathroom is larger than most cruise ship bathrooms for a standard sized cabin. There was a double closet with plenty of hangers, a safe, a mini bar and fridge stocked with sodas and beer and a tray of fresh fruit. There were bathrobes and slippers for us, as well as L’Occitane bath products and soaps. Our room attendant was sweet and turndown and make up service was always quick. One day, I had to leave a note for additional soap and shower caps, which in my opinion should be automatic, but otherwise, she was pretty attentive. The dining experience: We didn’t eat in the French restaurant, the Stella Rose, so it wouldn’t be fair to comment, except to say the dining room is classily decorated. The AmphorA is the main dining room. The food was always outstanding and well proportioned. It’s open seating, so you have the ability to show up and either dine by yourself or join others at a larger table. My husband and I are pretty social, so we opted to join others on most nights and found ourselves meeting new people and making some great friends. They serve specialized courses each night, but also have some standards every night, in the event you didn’t like any of the specials. If you want a specific wait staff, you can ask the matre’d and they’ll seat you in that server’s section. If you have allergies, all you have to do is let them know and they’ll provide you with a menu for the following night’s meal and you choose your options. They’ll prepare that meal selection with respect to your allergies. The Veranda is the restaurant for breakfast and lunch. We only had a couple of lunches on the boat, so I won’t give a large review on this, but the breakfasts were amazing! There’s a full buffet, a omelet bar and an a la carte order menu where you can get eat waffles, pancakes, eggs Benedict and more. At night, the Veranda is converted to the reservation-based restaurant for dinner. Candles is Serves lots of specialized choices. We had filet mignonette or chicken and seafood skewers. Everything was delicious and prepared to perfection! Entertainment: By day, The Windsurf has a platform water deck and on certain days, the staff will open it up, for water sports like kayaking, water skiing and just swimming in the open water. By night, the entertainment is limited, but you make it your own. There is a small casino with tables and slots. The main lounge had a 4-person band, but their song choice was “sappy” so we headed over to a deck bar, the Compass Rose, where a duo, “Marci Gras” rocked the place until they closed every night. There’s a crew talent show one night, which is silly fun. We didn’t do any shore excursions. We researched the ports and did our own thing. Some ports we just walked around and explored, in other ports, I hired private guides (for much less than the private tours offered by WindStar) so we could get a customized taste of the ports. Many people we met did take the shore excursions and the reviews were mixed based on the expectations versus the reality, but overall, they seemed to have a good time. If you would like to know about our excursions, feel free to contact me directly. We had such a great time that we were saddened to disembark in Venice. There was nothing we would change about this cruise, and I haven’t been able to say that on most cruises. My husband and I agree that after this experience, we don’t ever see ourselves on a large cruise ship again. The experience of getting to know most of the passengers, the crew and the intimacy of it all really appealed to us. 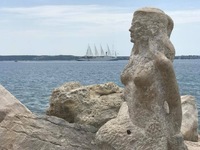 We would definitely consider another Windstar cruise and now that we’ve done the largest of the fleet, I’d be interested in trying the yacht/liner fleet as well....of course, it’s all dependent upon the itinerary. Another inaugural port for WindStar! A cute little town for walking around and getting lost in the city. There are lots of churches to see and he town is really charming. Again, we found a cafe to stop and eat, which became a tradition for us. We were the inaugural cruise for WindStar to this port! It doesn’t have a ton to see, but it’s charming and there are sights to see. We found a great restaurant for lunch where we had a pleasant and memorable day. We hired a private guide (just us and our guide) to Mt Etna and a wine tasting. It was a beautiful way of seeing the port and we could tailor it to our needs. It’s a beautiful city, but Game of Thrones has turned this beautiful city into a tourist trap, which I find sad. It’s overcrowded and all the restaurants and shops are geared toward tourism. We enjoyed walking the walls of the city, but it wasn’t a highlight to our trip. We took a private cycling tour in Stari Grad. This was a highlight to our trip. We got out of the port proper and see the rolling countryside, the wineries and the small towns. Because the larger cruise ships can’t reach this town, it has t been overrun with tourism. We walked the famous trail up the hillside up to the fortress. Beautiful views and then came down and walked through the city. Again, another charming town and good restaurants. We took the train to Pompeii and back. Upon getting back, we stopped and ate at a cafe on the water. Easy to get around yourself if you aren’t into doing shore excursions.